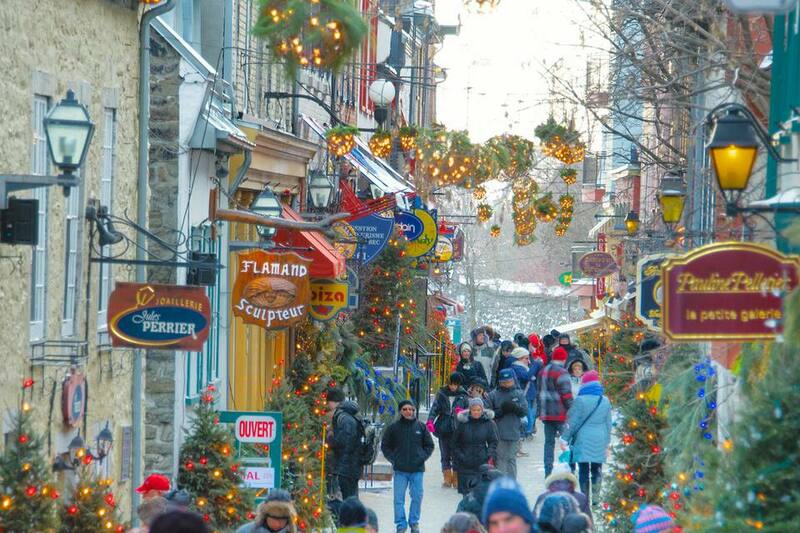 The Quebec Winter Carnival brings Quebec City alive with sub-zero merry-making every year, beginning late January or early February. The world's largest winter carnival, the Quebec Winter Carnival has been a highlight on the Quebec event calendar since 1894 and been giving Quebeckers and thousands of visitors a reason to celebrate during the cold, snowy winters. The Quebec Winter Carnival takes place in 2019 Friday, February 8 through Sunday, February 17. The Quebec Winter Carnival began when the inhabitants of New France, now Quebec, had a rowdy tradition of getting together just before Lent to eat, drink, and be merry. Today, the Quebec Winter Carnival is the biggest winter carnival in the world and is celebrated annually. Think Mardi Gras in winter and you have an idea of how big a deal the Quebec Winter Carnival is. No sense in fighting the cold—embrace and celebrate it. There are traditions that have endured over time. Red clothes, songs, the arrow sash, Bonhomme’s Effigy and the little shot of caribou that keeps you warm are all time-honored traditions going back to the origin of the Carnival, and sometimes earlier. For 2019, there is a new carnival organizer who is doing away with the traditional selection of a "Dutchess" to oversee the carnival. Instead, the focus will be on creating experiences of international caliber, with impressive parades and a new and improved palace for "Bonhomme," the carnival's snowman mascot. The Quebec Winter Carnival takes place at various locations in Old Quebec. Locations are within about a 1 km distance of one another, so for most people, walking distance. Keep in mind, Old Quebec hills are steep and proper footwear is a must. In addition, most every Carnival event is outdoors, so pack and dress appropriately. You can always take layers off, but if you or your kids are not warm enough, it can ruin the day. Sub-zero temperatures, bitter winds, and nighttime activities mean visitors should bring the proper clothing to enjoy Carnival. Temperatures at Quebec Winter Carnival generally range from about -17 degrees C to -3 degrees C (1 degree F / 27 degrees F). If you consider the wind chill factor, (how much colder the wind makes the temperature seem) the temperatures are considerably lower. The goal when dressing for a day at Carnival is to stay warm, but not to get hot and sweat, which can, ironically, make you cold. The atmosphere at Carnival and around town at restaurants and nightclubs is casual. Leave your high heels at home, pick fleece over flair. Many of the venues have some indoor activities where you can rest up, warm up, or grab a bite to eat. Though some carnival events, like the canoe race across the St. Lawrence River or the night parade 500, may require you to stand outside for long periods of time. On those days, dress correctly and follow up those events with an indoor activity. Kiosks and other outlets in the city sell the Bonnehomme figure (or effigy) tag for CAD$15 that gets you into most of the Winter Carnival events. Have cash on hand if you plan to buy from one of the street kiosks. Save $5 if you buy the effigy before January 1 for the upcoming carnival. You can also purchase your entry online. Some activities cost extra, but families can still have a full, fun day with just the purchase of the Carnival Bonnehomme figure. Sales of this figurine are the Carnival’s main source of funding. Visitors 8 years old or older must wear the official effigy to access Carnival sites. Plenty of accommodation deals are available during Carnival. The zip line, night parades, slide runs, concerts, snow sculptures, sleigh or dogsled rides, Ice Palace and skating are among the many activities offered during this year's Carnival. There is a crazy canoe race across the Saint Lawrence River that requires paddlers negotiate their canoe across an often patchy waterway—alternating between carrying and paddling the canoe. The ice slide behind the Fairmont Chateau Frontenac is unassuming to look at but you catch some serious speed. There is rarely a big lineup and it's only a couple of bucks to ride. Be prepared to haul your own wood toboggan to the top. The number one rule for dressing correctly for the cold—for most any cold weather or wintery wonderland destination—is to dress in layers. You can always take layers off as you warm up. For your first layer, start with a thin, wicking layer—like silk, polyester, or nylon, not cotton—next to the skin. Cotton tends to absorb water, like sweat, which will end up making you cold. The goal is to stay dry. The next layer should be fleece topped by waterproof layers. Be sure to wear layers on your legs as well as your upper half. Even a pair of nylons is better than nothing; but again, avoid cotton. Jeans alone will not cut it. If you have them or can get them, wear snow pants. Feet should be covered with wool socks. Cotton socks may make your feet cold. Wear water-resistant, insulated boots with good traction for Quebec's often icy, steep streets. A hat, scarf, and mitts are a must. Hats with ear flaps are great for keeping your ears warm. In most cases, mitts are warmer than gloves. If you get caught in heavy snowfall, an umbrella and sunglasses may come in handy to keep snow out of your eyes and face. If can find disposable heat packs—usually you can get two for a few dollars—they are a must-have in case you start to freeze up. The heat packs can go into boots, mitts, and pockets and last from 6 to 10 hours. Another way to warm up is to have a Thermos full of hot chocolate or soup with you. Ice cleats, which can usually be strapped to your shoes or boots, may also come in handy. Old Quebec City streets are extremely steep and can get icy. To get into the winter carnival spirit, wear the official red carnival sash around your waist. You should be able to buy this around town. Parents with children younger than 4 years old, may want to bring a toboggan, heavy-duty stroller, or wagon and blanket to go in it. The snow and hills are a challenge for kids and can tire them out. About 20 minutes away, Valcartier Villages Vacances Winter Playground is acres of hills, ponds, play structures, all constructed and groomed with slip-sliding in mind, whether by tube, raft, skates, cart or bum. Wendake, about 15 minutes from Quebec City, offers a compelling glimpse into the heritage of the Huron-Wendat First Nation people that live there.